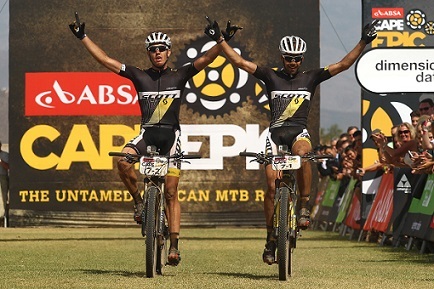 Philip Buys and Matthys Beukes took over the lead in the Absa African jersey competition after an audacious early break that saw them win the 111km fourth stage of the 2015 Absa Cape Epic today. Former leaders Darren Lill and Waylon Woolcock (RED-E Blend) lost more than eight minutes on the Scott pair and are now trailing them by two minutes in the overall standings. Buys and Beukes completed the route in 4:19:19, three minutes ahead of Kristian Hynek and Alban Lakata of Topeak Ergon. An elated Buys admitted afterwards that he and Beukes had taken a gamble by breaking away inside the first hour. “We went hard from the start,” he said. “I said to Matthys that I couldn’t hold the pace for another three hours, so we backed off. “But then I started feeling better and the gap just kept growing. Towards the end we controlled it,” said Buys. Investec-Songo-Specialized’s Christoph Sauser and Jaroslav Kulhavy placed third on the day but remain in the overall lead. “Every day in yellow is like winning a break point in tennis and today was another set won,” said Sauser. Hynek and Lakata remain second overall, with Spain’s Jose Hermida and Dutch partner Rudi van Houts (Multivan Merida) third. Four-time winner Karl Platt of Germany and Swiss partner Urs Huber are fourth after losing another two minutes. Friday’s fifth stage will feature a 117km route with a 2 500m ascent from HTS Drostdy to CPUT’s Wellington Campus.